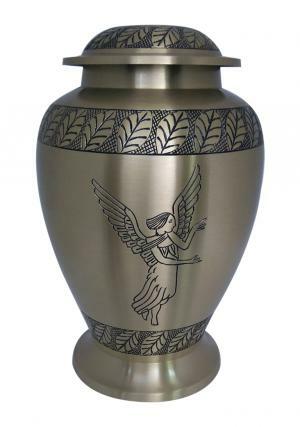 Angel Engraved Brass Floral Adult Urn with pewter finish of flower engravings bands decorated around the urn. Adult Floral urn engraved in angel made of brass metal is finished in pewter. The engravings on the urn are printed with leaves from skilled artisans. 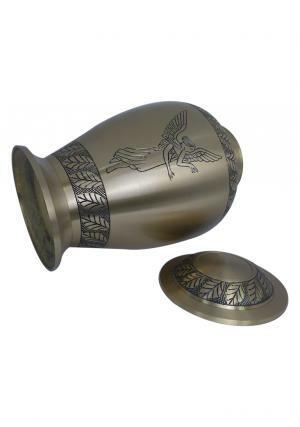 The top lid of angel engraved brass floral adult urn is decorated in band of leaves with screw threading for a secure closure loved one’s ashes inside the urn as memory of last remains. 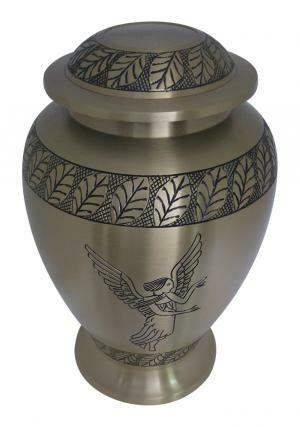 The Brass floral Engraved Brass Adult urn with pewter finish is measured to 10.24 inch height, 6.7 inch width and weighs 2.27 kg. 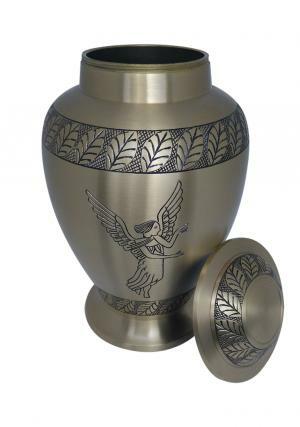 The large angel engraved adult urn is capable of storing or preserving 200 cubic inch of human ashes.